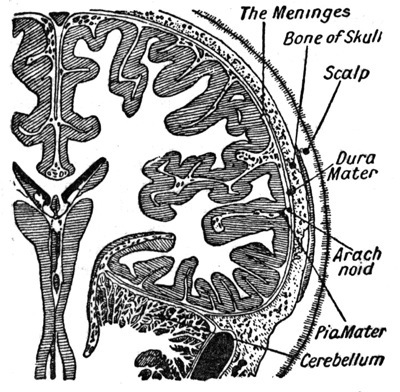 Bacterial meningitis is a common form of meningitis, infection of the coverings of the brain and spinal cord, caused by various forms of bacteria. The bacteria grow primarily in the subarachnoid space in the cerebrospinal fluid, causing inflammation of the surrounding structures. Bacterial meningitis is one of the most severe forms of meningitis and is life-threatening if not treated promptly. It is a true medical emergency. In adults, the most common causative organisms responsible for this disease include Neisseria meningitides and Streptococcus pneumonia although several other bacteria can be implicated, including Haemophilus influenza, tuberculosis, gram negatives, Listeria monocytogenes and others. Another common cause of meningitis are viruses. To learn more about viral causes, see the Viral Meningitis page. Meningitis symptoms generally include headache, high fever, stiff and/or painful neck, photophobia (avoidance of bright lights), nausea and vomiting and deteriorating level of consciousness. If a patient presents with the signs and symptoms of meningitis they generally undergo an lumbar puncture (spinal tap) to obtain cerebrospinal fluid for analysis. This can help make the diagnosis of bacterial infection as well as help to guide treatment by isolating the causative organism so that antibiotic therapy can be tailored to the specific case. Antibiotics directed toward the causative bacteria is the mainstay of treatment along with general supportive measures. The patients are generally hospitalized and antibiotics are given intravenously. The exact type and duration of treatment can vary from patient to patient depending on the severity of disease and the type of causative organism. Done with the Bacterial Meningitis page?